With the development of advanced all-in-one inkjet computer printers such as WorkForce WF-3620 from Epson, running productive business establishments is no longer a challenge. Buy one to get a scanner, copier, and printer combo with a novel Wi-Fi Direct feature that enables you to print directly from the Internet. Featuring a reliable PrecisionCore engine, speed is impressive (10 ISO pages per minute (ppm) in color and 19 ISO ppm in black. Ink use is also super-efficient (up to 40%) while the large (35 page) Auto Document Feeder it comes with enables you to print longer without having to reload paper every time. Buy one to enjoy clear and smudge-free prints with crisp fonts, precise lines, and precise color placement. Offering users the convenience of wireless connections in homes and offices, HP Envy 5540 is a well-designed photo printer, scanner, and copier that comes setup and ready to use out of the box. 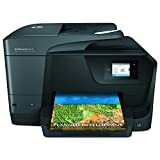 Instead of depending on computers to print your documents, you can easy print directly from smart devices such as phones and tablets with this printer (via the Wireless Direct Printing and AirPrint features). Its photo tray is sturdy and designed to accommodate various paper sizes (5 x 7-inches and 4 x 6-inches, for instance) while the original HP Instant Ink tanks that it uses cuts down printing costs by up to 50%. If you run a bureau or print many documents in your office every day, you will have a memorable experience with this printer. By far one of the most trusted manufacturers household and office accessories, Canon is a reputable brand that has offered users value for years. For those shopping for ink jet printers, for instance, Canon MG5720 is one of the best products to purchase. Featuring an advanced all-in-one design (printer, scanner, and copier), you do not have to spend a lot of money on several third-party accessory to run a successful office. It also supports tablet and mobile printing via its advanced AirPrint technology and supports printing directly from the cloud via a unique Google Cloud Print technology. Canon MG5720 supports two-sided printing that cuts paper consumption by up to 50% and uses genuine canon ink tanks. 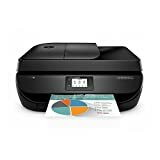 HP OfficeJet Pro 8710 is a fully-featured (copy, fast, and print) wireless printer with long-lasting instant ink tanks and an advanced Mobile Printing technology (AirPrint) that enables you to print directly from your smartphone or tablet. This is super convenient, particularly in office settings. Made of heavy-duty plastic, this printer is durable. Setup is straightforward while its efficiency and support for duplex printing (two-sided) benefit individuals that looking to cut down printing costs. You also get a large (2.65-inches) colored touchscreen for easier setup, faster print speeds (18ppm in color and 22ppm in black), and a one year limited hardware warranty. To produce laser quality documents at home and in your office without spending money on an expensive laser printer, HP Envy 7640 is a valuable product to consider. Compact, durable, and with a professional-grade all-in-one design that users appreciate, it is perfect for household and commercial use. Printing from computers and NFC-enabled devices is straight forward, while the efficient ink tanks that it uses lower consumption by up to 50%. This way, with an original model, you will enjoy the best quality while keeping spending low. HP Envy 7640 is affordable, has a large 25-sheet auto document feeder that eases management of multiple pages, and has an advanced Windows 10-compatible design that never disappoints. Featuring an aesthetic black themed body that blends well in office environments and a fast all-in-one design that prints up to 5.2 pages per minute in color and 8.8 pages per minute in black, HP Envy 4500 is a notable inkjet printer that connects to laptops and smart devices via a WiFi 802.11n wireless adapter and high-speed USB 2.0. Attainable cheap in Amazon, the value that it offers is admirable. Its durability is a major draws, while the efficient ink cartridges (color and black) that it uses deliver value while keeping spending low. Are you shopping for a replacement inkjet printer for the under-performing model in your home or office? If you have saved a few dollars and want value for money, HP OfficeJet 4650 is a top-rated budget model with a high-performance all-in-one design that individuals appreciate. It is instant ink-ready. The mobile printing technology that it uses is responsive, while its ability to scan, copy, and fax excellently have made it a preferred all in one office accessory. With an original one, you will also enjoy two-sided printing that cuts paper use by 50%, efficient (up to 50%) ink tanks, and a premium printing head that produces laser quality documents that do not smudge in storage. HP offers a one-year hardware warranty for this inkjet printer. Known for its durability, Brother is an acclaimed brand that works well in high-traffic settings. If you are setting up a department in your office, for instance, and want a premium inkjet printer that will not break down after one or two sessions, Brother MFC-J480DW is a notable model. With an original, you get a professional-grade all-in-one printer with an easy to use wireless technology that diversifies your printing options. Copying, faxing, and scanning are also straightforward while its support for two sided printing and the large auto document feeder (100 sheets) it comes with improves its suitability for heavy-duty printing applications. You also get a colored 1.8-inch touchscreen with on-screen menus that ease navigation and a one-year warranty that covers defects. 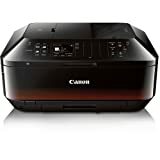 Popular in top 10 best inkjet computer printers , Canon MX922 is a top of the line business and office printer with effective mobile and wireless printing technologies that users appreciate. Affordable, durable, and with a responsive all in one design that handles printing, scanning, faxing, and copying jobs, the value that it offers is unmatched. The fully integrated auto document feeder (35 sheets) buyers get improves its functionality while its advanced auto duplex printing technology not only cuts down paper consumption but also eliminates the hassle of turning pages manually to print on both sides. Canon MX922 works well with both single and combo tanks. It also supports AirPrint and Google Cloud print, and has a one-year warranty. HP Envy 4520 tops our list. It is instant ink ready, supports printing directly from smartphones and tablets via AirPrint, and has a wireless all-in-one design that never disappoints. Setup is simple. Power consumption is on the lower side while with its print speed and quality has made it a sought-after inkjet computer printer all over the world. Other notable features are two-sided printing, borderless printing, and the plethora of paper sizes that it supports. Buy one to get a one-year warranty.